Hi – Aunt Geri here. The Salmon Patties are done – no, not the fish salmon but the other peachy colored goodies that I promised in my recent post “A flock of flamingos“. The “Patty” pattern is pretty popular for us. It is a fairly dense combination of 2 yarns that is reversible but different on both sides. I made a scarf and a headband that ties in the back for a custom fit. This entry was posted in Fashion, fiber art and tagged knitting, scarves. Bookmark the permalink. Would you give me the pattern for this “Patty” scarf? This isn’t really a “pattern” – it is more just a stitch style. 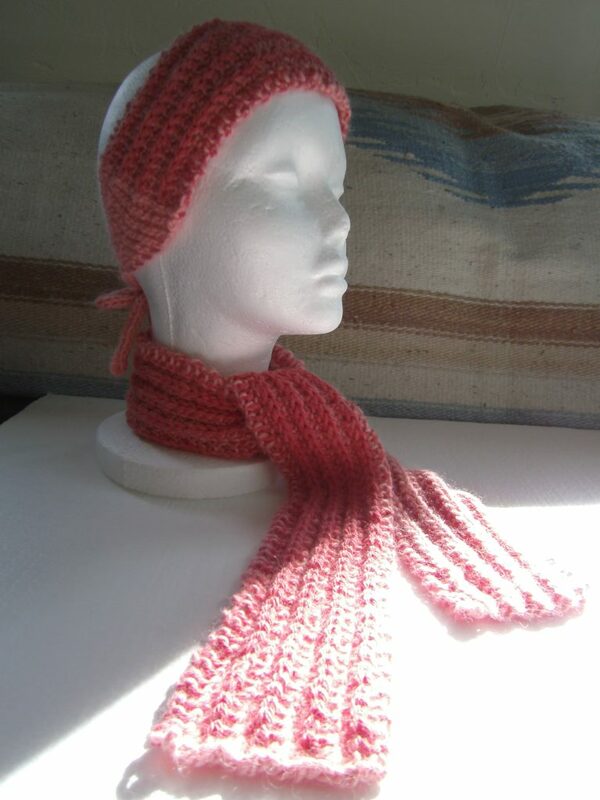 It is double knitting in that you knit each row twice – once with the “main” color and once with the contrasting color, kind of in multiples of 3 stitches. I don’t really know how to explain it in an email but you work 2 rows on the right side and 2 rows on the wrong side, slipping stitches to accommodate the “running” stitches on the opposite side. Sorry – it is kind of hard to explain in words.